New TI Find - a LCD version of the Datamath!!! We have information and photos of a calculator which was only rumored to exist. 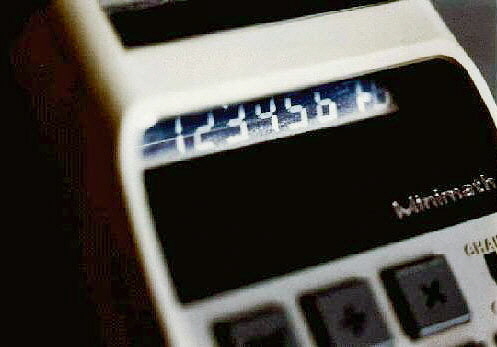 The Minimath is a Datamath's (TI-2500) visual twin. The boxy, yet stylishly smooth, case looks the Datamath. But the difference is the color (white instead of beige), the display is LCD, and the top has a cutout with a clear "window" to help light the LCD. We have two photos of the Minimath. The first is an overall shot from above. The second photo shows a closeup of the LCD display from the side. 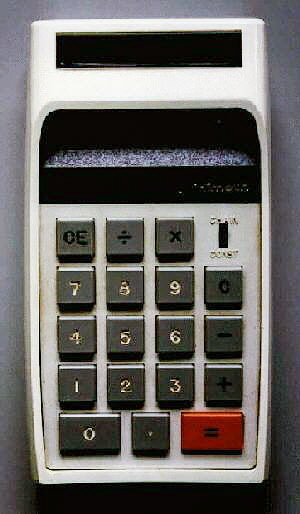 This calculator was produced in mid to late 1972 as a companion to the Datamath and used the LCD display to reduce the power requirement of TI's first calculator product. However, production problems with the LCD display (then a new and unrefined electronic product) could not be resolved. Production of the Minimath was halted. At this time, only one is known to exist, but there may be a few more lost in desk drawers of some TI engineers and production people. Extra detail: This may not be clear in the photos but above the chain/constant switch on the keypad area, "Minimath" is "engraved" into the black trim of the case and the letters are gold colored. Thanks to CB Wilson for his help in obtaining the information and these photos for us. TI readies more calculators: Texas Instruments isn't going to limit its attack on the consumer calculator marketplace to the rechargeable LD2500 Datamath, a hand-held, LED-display machine selling for $149.99. TI has printed promotional material for the LC2000, a liquid-crystal version that runs as long as 20 hours on size AA batteries..."
"Electronics Newsletter", Electronics, July 3, 1972, p25.